I purchased this timepiece from GearBest, an online shopping outlet that specializes in electronic devices. It arrived adequately packed and on schedule. It cost me thirty-one dollars and shipping was free. 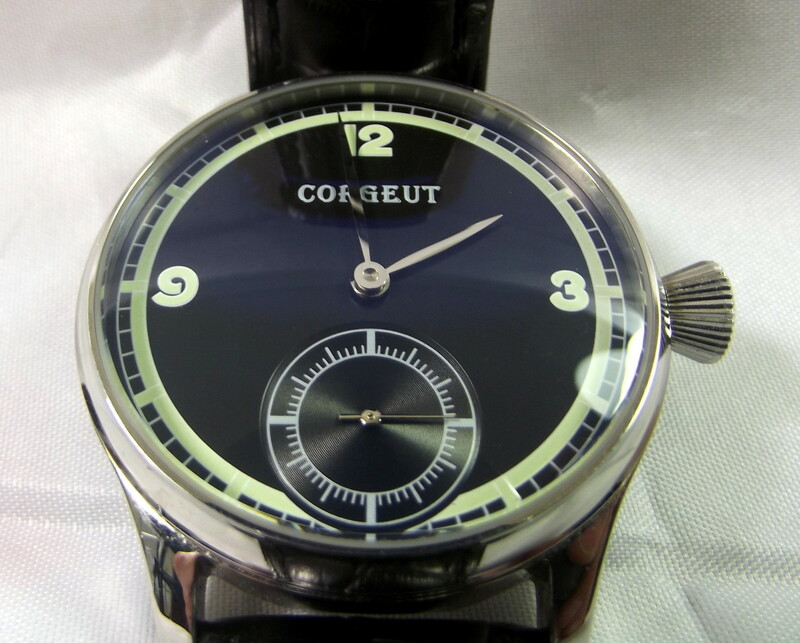 The C1101 is a large watch which, if you include the protruding crown, measures 47mm across. It is 16 cm thick and weights in at 88 grams (3.11 ounces). The band is black and composed of decent quality PU leather. 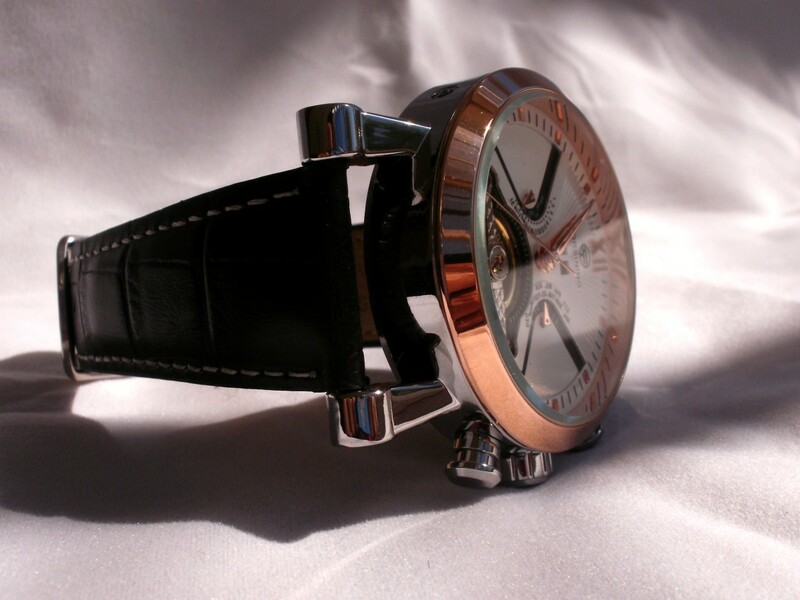 The strap’s width measures 22mm where it is attached to the case, tapering to 18 cm. It is secured by a silver colored pin buckle. 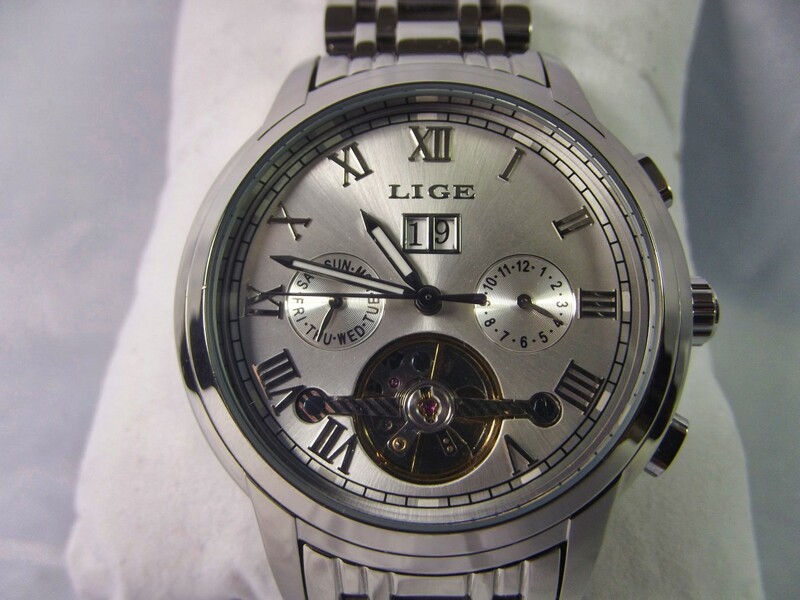 Several vendors identify this watch as a Toubillon, which infers accuracy has been improved by encasing its balance wheel and escapement within a rotating cage. Such mechanisms, while admittedly cool, are not cost efficient. 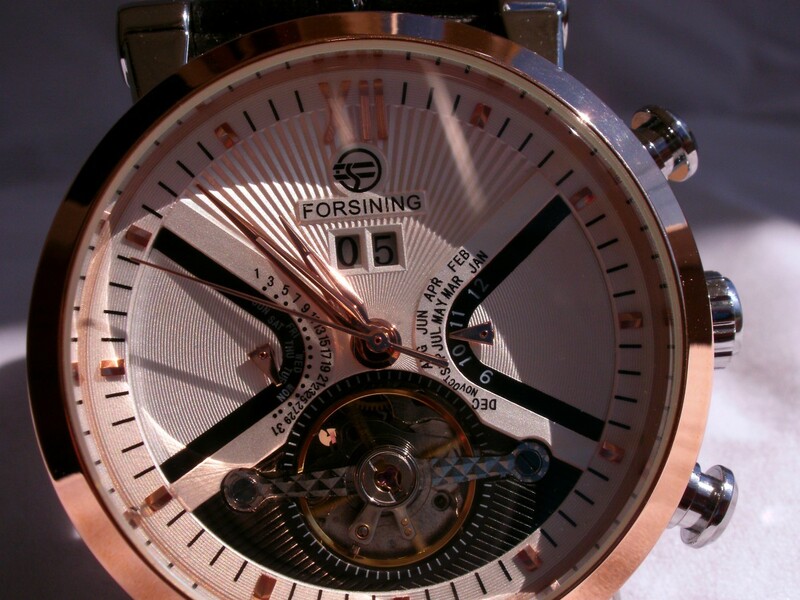 Forsining simply cut a circular hole into the dial, exposing the balance wheel. The date of the month is displayed near the top of the dial. A tiny golden pointer indicating the month, is below and slightly to the right. Another pointer, indicating the day of week, is positioned to the left. Two pushbuttons flank the watch’s crown. The upper button advances the day of month and the bottom adjusts the month. 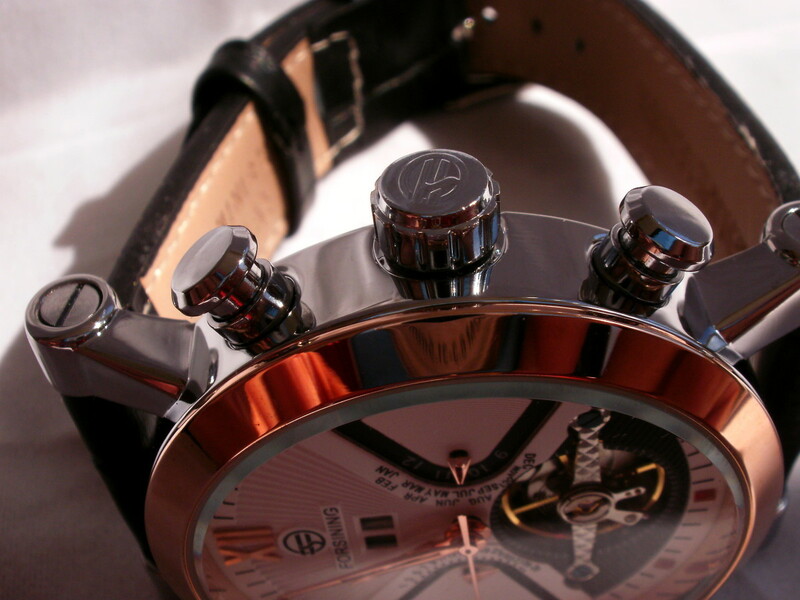 A depressed button on the left edge of the watch is used to advance the day of week subdial. 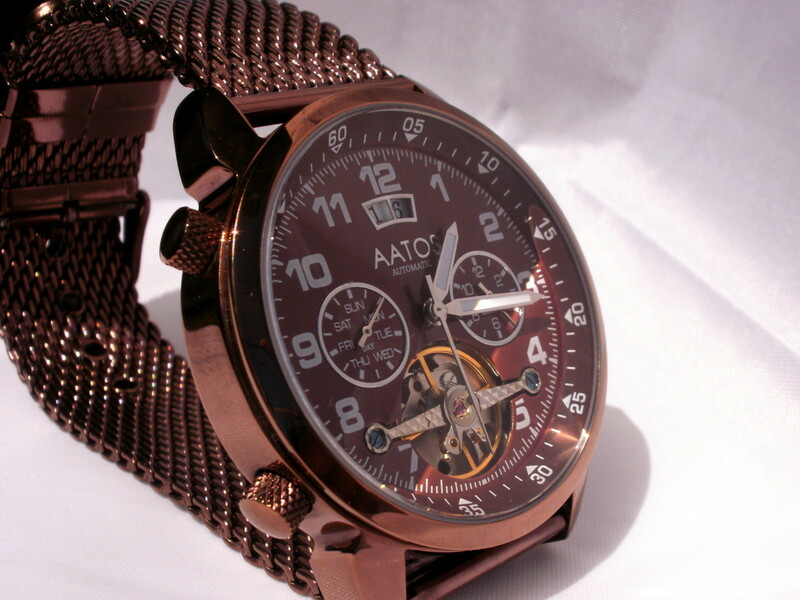 The C1101’s case is composed of shiny stainless steel and topped with a gold colored bezel. Studs which designate the individual hours continue this theme. This watch is available in a variety of colors. 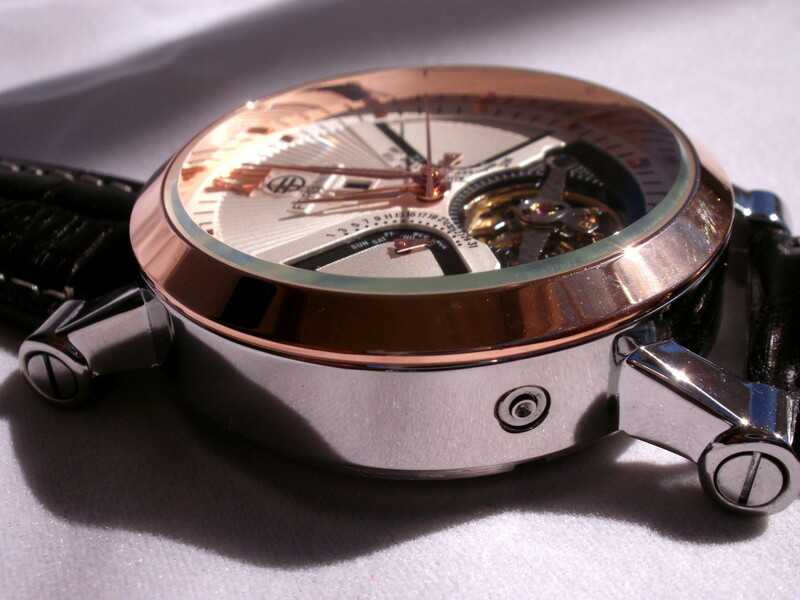 A window incorporated into the back of the case reveals the inner workings of the movement. While water resistance information was not engraved onto rear of the case, the vendor notes the watch is splash proof only. 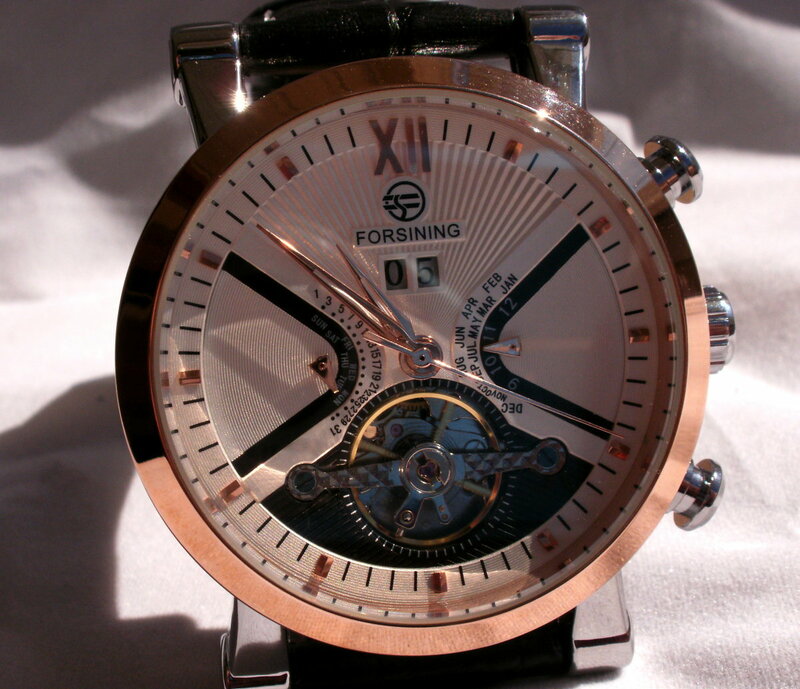 I have also reviewed the Forsining U0W7 automatic watch. While I prefer this timepiece, the U0W7's styling is impressive. Forsining is a division of the Guangzhou Ruixue Watch Company Limited. (Forsining watch company limited). Their manufacturing plant is located in GuangZhou China and this company’s products are marketed under the brand names, Forsining, Winner and Jaragar. The focal point of this watch is its exquisitely designed dial. Two curved black lines create the outline of a sundial. The top section is textured in a manner suggestive of a handheld fan and the bottom portion occupied by the rapidly whirling balance wheel. 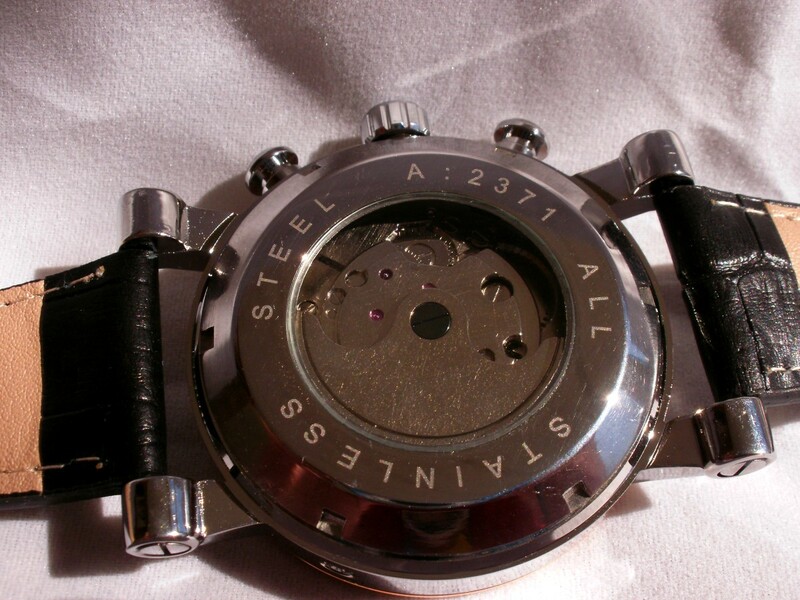 To the left and right, areas reserved for the subdials are tightly engraved in a pattern that emulates the rounded shape of the case. Along the black lines in this vicinity, there are a number of indications representing the day of week and month of year. These are strictly decorative. The color of the watch’s bezel matches that of the hands and the studs placed as hour markers. The hands stand out well against the white background, ensuring that time can be easily determined. This design reeks of originality and freshness. I inserted the Forsining C1101 into my Diplomat watch winder for five days. During this test period it gained an average of 14.6 seconds per day. I consider this result quite good for a watch in the thirty dollar price range. In order to present a clean and uncluttered dial face, Forsining chose not to include the month and day indications associated with the subdials. They work correctly but the tiny gold hands point at open space. The day of the month function performs well. In a separate test I hand-wound the timepiece and laid it aside. Twenty-four hours later the watch was still running and reflecting the time accurately. This timepiece appears reasonably sturdy. All pushbuttons felt tight and performed well. I did, however, note a slight sloppiness within the movement whilst adjusting the time. 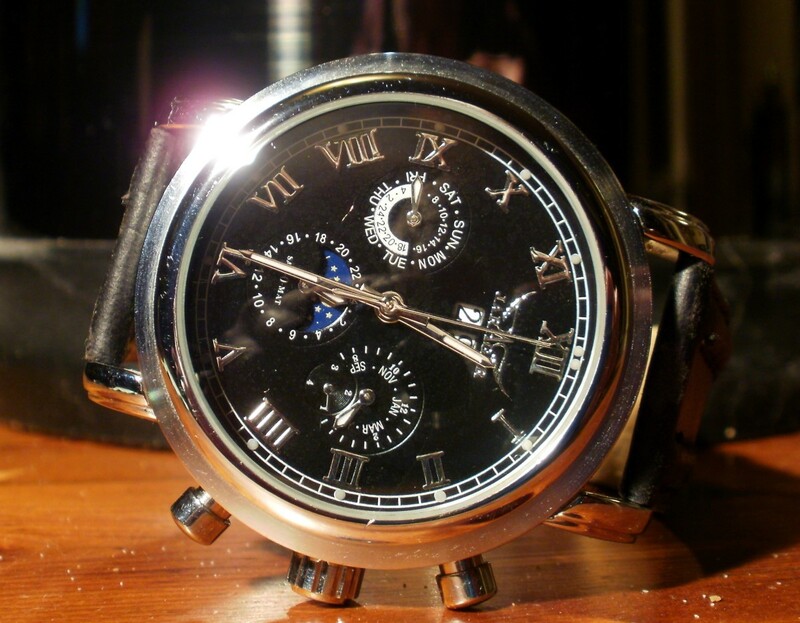 Mechanical watches require cleaning and lubrication every three to five years. If not properly maintained, accuracy will suffer. Due to the high cost of periodic maintenance, timepieces in this price category are normally not serviced. In my judgment, if not maintained, this watch should run well for the first couple of years. Then, as dust accumulates and lubricating oils dry, accuracy will suffer and the timepiece will need to be wound from time to time. Ultimately the watch will fail. Although its subdials are best described as whimsical, this timepiece is reasonably accurate. Forsining, a company that understands the power of an attractive design, has put a great deal of effort into the layout of this watch’s dial. This work has paid off and, despite the C1101’s shortcoming, it should sell well. 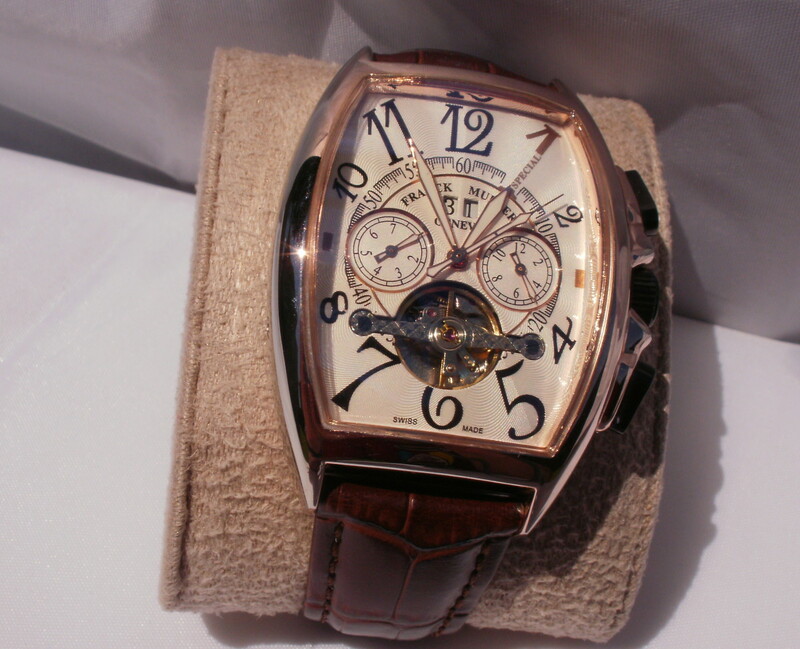 Every individual has their own preference with regard to the proper size and weight of a timepiece. In my opinion the Forsining C1101 is a large and bulky watch but, for those that proudly wear a Uboat U1001, this inexpensive Chinese automatic would be considered puny. I’m interested in your preference and would appreciate it if you would participate in the following survey. What is the maximum size of a watch that you would consider purchasing? 36 cm in diameter and 10 cm thick. 40 cm in diameter and 12 cm thick. 44 cm in diameter and 14 cm thick. 48 cm in diameter and 16 cm thick. 55 cm in diameter and 20 cm thick. Why does the poll say 44CM in diameter instead of 44MM in diameter? I would not want a watch that is 44CM across. Poor editing on my part. Any change to the wording will result in every answer submitted before the edit being deleted. Centimeters should be millimeters. How do you start the Forsining wrist watch? It is an automatic watch. You should turn the crown clockwise a few times to start it. Then, set the timepiece and strap it on. Your normal wrist movements during the course of a day should keep it wound. How can I start an automatic forsining watch? Shake or wind the watch. Hi, Dhmie. I checked out the Forsining 98072 on Aliexpress. 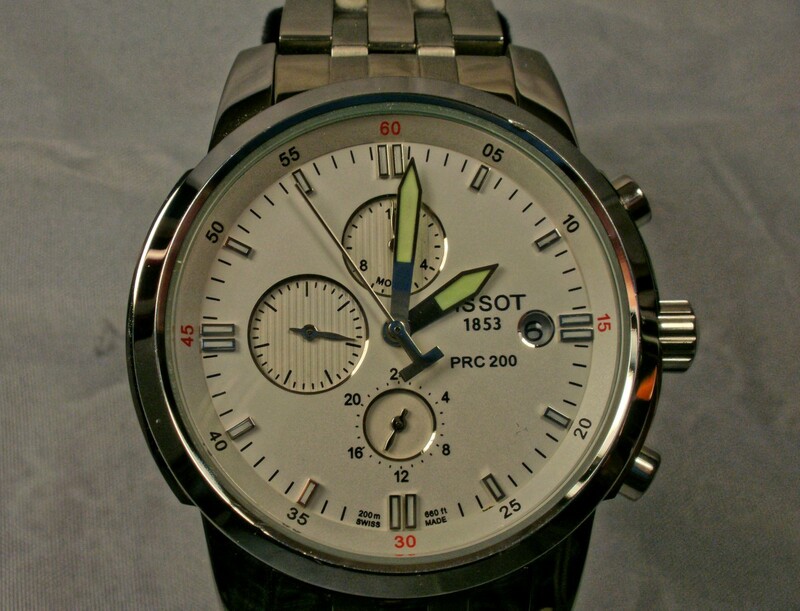 It's a nice looking timepiece and, because it is quartz, should be accurate. 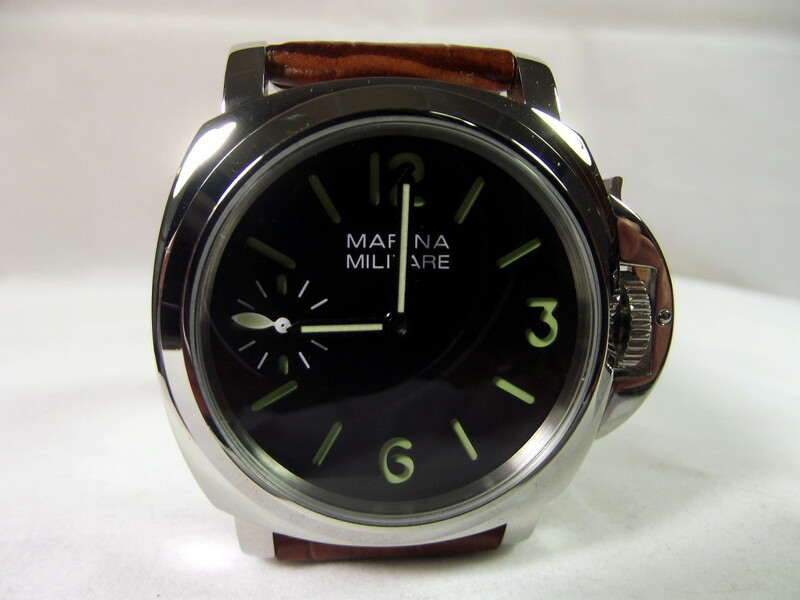 Forsining quality control is not the best but, if the watch arrives broken, you can always send it back. 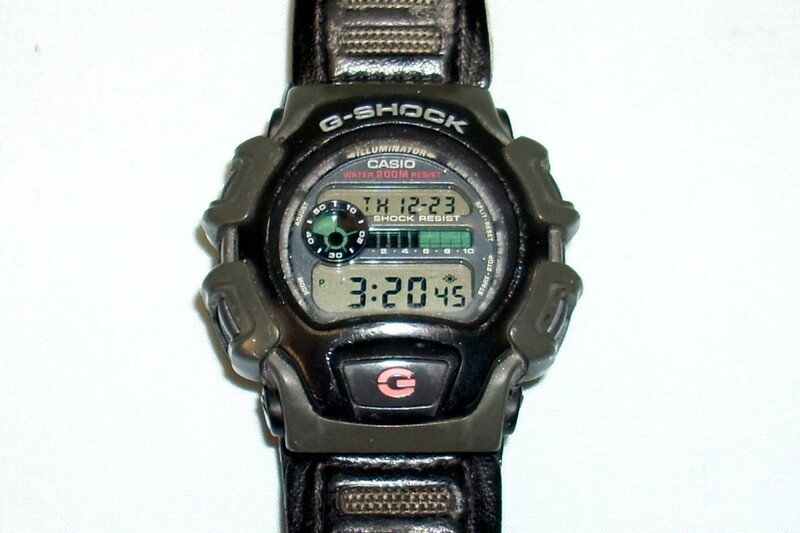 If you find that you really like this watch, let me know. I might purchase one and conduct a review. Ooops! I'd fire my editor if I had one. Thanks for pointing out my error, Entenpoter. The article has been corrected.